NEW YORK—Behind most chefs lie stories about the things upon which friendships and family ties are built: food. 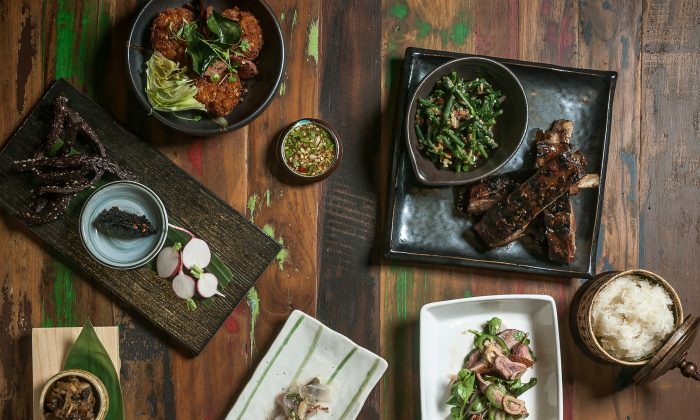 Soulayphet “Phet” Schwader, executive chef at Khe-Yo, the new and only Laotian restaurant in the city, is no exception. And he is immensely grateful to be where he is today. Schwader left Laos at the age of 3, in 1978. The communist Pathet Lao movement made life hard for anyone perceived as even remotely associated with the U.S. government, and in 1977, his family crossed the Mekong River, the natural border between Laos and Thailand. His father passed away in a Thai refugee camp. His mom remarried twice, but she was to lose both husbands, and he, two father figures. A troubled political climate in Laos set Schwader and his family down in Wichita, Kan. His childhood is a picture of Laotian culture meeting Kansas culture. Schwader said he grew up very poor but his mother made sure there was always food on the table. His most salient memories around food was that it was always very communal. And occasionally, a small farmer would be called upon to butcher a cow; and about 20 Lao people would take a day to break it down and divide it among their households. Laotian cuisine uses an abundance of greens, herbs, and lettuces. At Khe-Yo, Schwader serves the flavors he grew up eating at home, albeit with a few twists of his own, such as the use of seasonal produce. For a papaya salad, for example, he has recently started using julienned butternut squash. What makes Lao cuisine Lao? It’s a question he’s asked himself, and his mother. The ingredients in the region are common to all the neighboring countries: Vietnam, Thailand, and Cambodia. For thousands of years, national borders have evolved. The easiest way to describe it, he said, is that it’s somewhere in between Thai and Vietnamese, which is just as true on the map as on the plate. The use of sticky rice is prevalent, and dishes are eaten with one’s hands. Schwader steams rice every half-hour to 45 minutes. Schwader makes his own pradek, an essential ingredient he finds distinguishes Lao cuisine. For example, along the Thai-Lao border, if you ask for a papaya salad, you’ll be asked: the Thai or Lao way? The only difference is that the Lao version includes pradek. It is a famously stinky paste made of fermented fish. He uses grilled sardines but he said any small fish will do. In Laos, people use perch, for example. Every household makes their own, and has their own recipe. “When I make in the kitchen, everyone clears out,” he said of the staff who begged to be spared being around the smell. The best way he explains its use is to draw a parallel to the use of crushed anchovies in an Italian puttanesca sauce. “The anchovies round out the flavors.” So does pradek’s salty pungency. It’s not just fermented fish alone, but is augmented by aromatic flavorful additions—garlic, chili, sugar, toasted rice, lime. For newcomers to Lao cuisine, Schwader points to the Nam-Khao appetizer ($10), crunchy coconut rice with spicy kaffir lime sausage and baby iceberg. Protein, in Lao cuisine, is not the focus, he said. The Jurgielewicz duck salad, Laap Peht ($15) is a bright and fresh study in contrast and textures. A duck breast is served with kale, arugula, lemongrass, shallots, and augmented with Schwader’s own touch, bits of crispy langue de canard, or in English speak, duck tongue. Schwader hopes to create a pho soup, for winter. At regular pho places, the soup is served with a few simple additions, including bean sprouts. In his household, Schwader said pho is served with a long list of add-ons including bean sprouts, long beans, Thai basil, scallions, and a condiment made of a mix of hoisin and sriracha sauce, and pork rinds. Schwader’s mother came to the opening of restaurant for friends and family, and was immensely proud of her son, though not without expressing a little hesitation. Would people really eat Laotian food? And her son was making his own pradek! Would they really eat it? She was back recently for a visit at the end of a busy summer for her son. And there people were eating dishes, made with the pungent pradek, and sticky rice, and all manners of herbs and condiments. And in the traditional Laotian way, the diners were eating with their hands. Khe-Yosk, adjacent to Khe-Yo’s entrance is open Monday–Friday: 11:30 a.m.–2:30 p.m., and offers banh mi sandwiches.